Last Christmas, singer Alicia Keys, wearing red bauble earrings, posted a video on Instagram, in which one of her sons instructed her not to scream when she saw her present. But Keys danced and shrieked anyway, so much was her joy upon seeing a sleek 52-inch rectangular Mirror mounted on her wall. 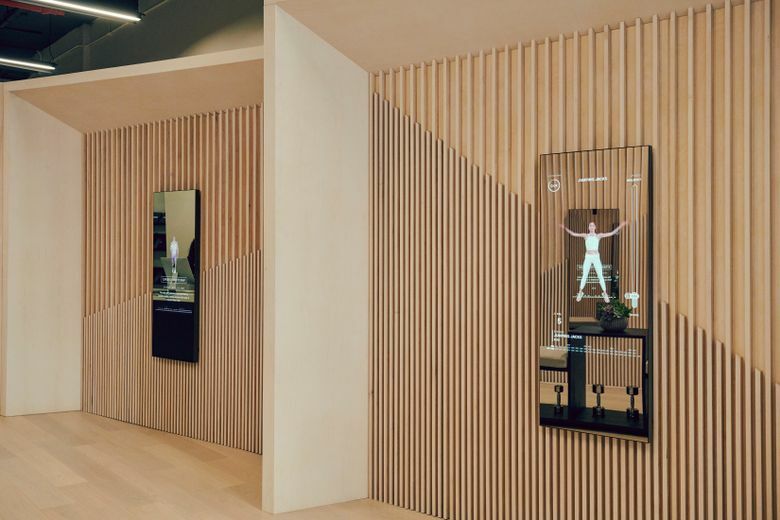 When turned on, the otherwise unassuming-looking bit of home décor morphs — like Through the Looking Glass gone athleisure — into a gym portal, offering screenings of some 70 live fitness classes per week, including boxing, dance cardio, high intensity interval training and yoga. Users are face to face with the instructor; you can see your entire body as well as a shrunken-down image of the instructor’s. The device is controlled by an app, so as to avoid fingerprints on the reflection. All the usual caveats about data collection apply. “I love this can you tell? ?” Keys wrote in a caption for the post. Keys is one of the most vocal in a wave of high-profile early adopters of the Mirror, which first came on the market in September. Reese Witherspoon also recently posted a video to Instagram; she used the device, which retails for $1,495, to take a boxing class. Putnam, 35, does Google those who have bought the Mirror, just as she used to with first-time clients at Refine Method, the boutique gym she founded. But often she only finds out whom the purchase is for when employees arrive at the customer’s home to install it, or when her company receives questions about putting the device on a high-security Wi-Fi network. “That’s how we found out about Leslie Mann and Judd Apatow,” Putnam said, referring to the firewall issue. Her company, whose offices are in the NoMad neighborhood of New York and has raised $38 million from investors, is selling $1 million of the 1.4-inch-thick Mirrors per month, she said. Putnam is refreshingly new to the courting of celebrity, and speaks of influencers (she gave Mirrors to Sara and Erin Foster, who have a lot of famous friends) and “public clips” (those Instagram videos) with the delight and faint ostentation of someone who has just learned a foreign language. She created Refine (which has a devoted, though not boldfaced, following) after a year spent grilling sports scientists and professional athletes’ trainers about what got results. Mike Boyle, whose clients include NFL players and other elite athletes, told her she was right about the lunges. But in spring 2016, newly pregnant, Putnam found herself in the strange position of being the owner of a gym with an optimized-down-to-the-minute workout she could not face doing. Around that time, she also conducted a Refine members survey about improvements she had put into effect, including new class times and custom-made equipment. Turned out, simple mirrors she’d put in at the last minute were by far Refiners’ favorite change: They liked the instant feedback. 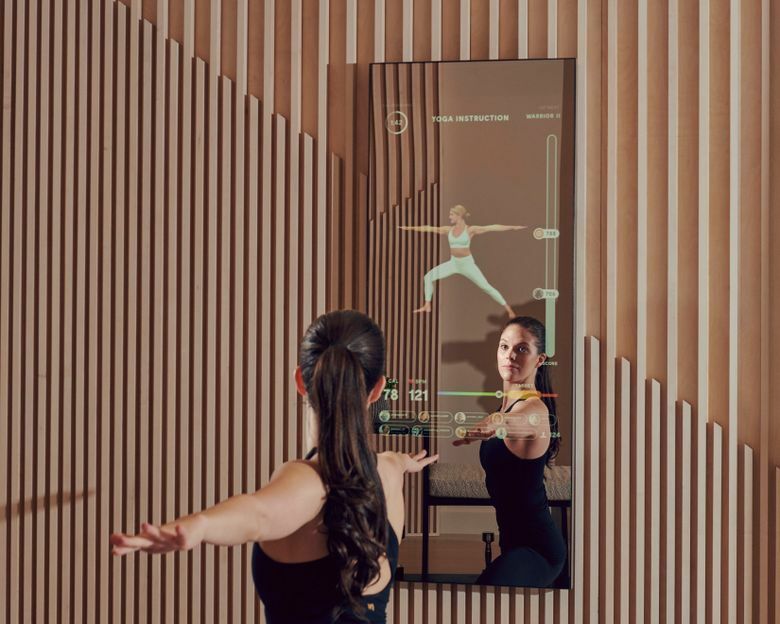 Mirror’s required $39-per-month subscription, on top of the outlay for the equipment, offers four levels of classes, absolute beginner to expert, and all can be modified according to injury or pregnancy (each instructor films substitute moves, which pop up on screen according to user preferences). There is also a library of hundreds of on-demand classes, so in theory this cost can be amortized. Lindsey Bradley, an actress who lives in Brooklyn, said the workouts were as good a sweat as the boutique studios she had attended as a ClassPass user. And as a bonus, she no longer has to stand on a chair to get a view of her outfit in a cabinet mirror. “I legit use it as my full-length mirror,” Bradley said. “You would never in a thousand years know it was a piece of workout equipment.” Bradley used to own an elliptical machine; it now functions as her mother-in-law’s clothing rack, she said. Next up for Mirror is personal training, which will start at $40 per session; the device has a camera, and yes, a lens cap, lest you be concerned about privacy issues. Also there will be sports prep for children, because the Mirror is averaging 2.2 users per household, the company says. Later will come treadmill and spin workouts, like those offered by Peloton, a 6-year-old company now valued at $4 billion that was recently mocked in a merciless Twitter thread. The Mirror company has big plans for the device to be users’ third screen, after their phone and computer, with the capacity for everything from photo organizing to chat. Users can now shop with the Mirror, buying fitness gear and other instructor favorites.